The leader of the Roman Catholic Diocese in San Diego was recovering Thursday from a stroke. According to a statement from Monsignor Steven Callahan, Bishop Cirilo Flores was stricken Wednesday in his office and taken to a hospital by paramedics. He was “alert and in good spirits” Thursday, and will remain hospitalized for a few more days, Callahan said. The stroke came only four days before Flores was set to make his Twitter debut. Flores became the fifth Catholic bishop of San Diego last September when he succeeded Robert Brom. The 65-year-old native of Corona was named a coadjutor bishop in 2012. The Loyola Marymount University graduate earned a law degree at Stanford University and spent many years as a priest in Orange County after being ordained in 1991. 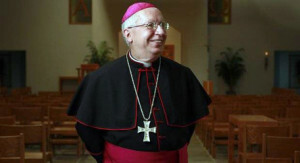 He was named an auxiliary bishop in 2009. Flores also served on the U.S. Conference of Catholic Bishops’ subcommittees on Latin America and Hispanic affairs. The San Diego diocese, established in 1936, consists of 98 parishes, 14 missions and 90 schools and preschools in San Diego and Imperial counties.